This week we give you an update on whats been going on with the project recently, what progress we’ve made and what we’ll be working on next! 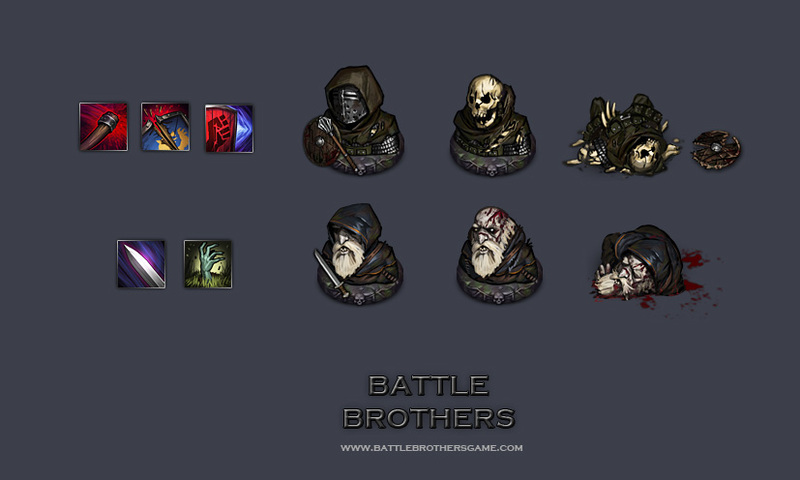 Last week we got the first mentions of Battle Brothers on some external pages and we are pretty excited about that. To start off, Craig Stern of indieRPGs published an announcement article on the game including some screenshots and a gameplay video. Thanks again, Craig! Secondly, we got a front page news article on RPGwatch that drew quite some attention to our project. The news articles on their page travel down pretty fast but they surely have a large audience. Thanks, RPGwatch ! Finally, we got a mention on a Korean site. 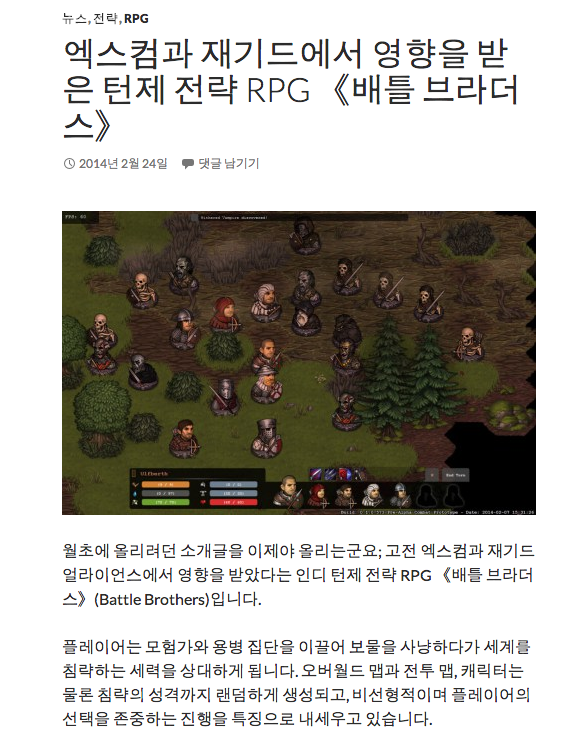 We don’t speak Korean, but from what we could gather it’s the announcement of Battle Brothers as well. And probably some facts like this going to be the best game ever. During last week we made some additions to the tactical combat. First, as we already revealed, the Necromancer of the Undead faction made it into the game with all his skills and AI in place. He isn’t that hard to kill and neither does he do a lot of damage by himself. What makes him really dangerous is his abillity to revive fallen combatants, no matter what faction they belonged to, as shambling Undead. If you don’t take him out quickly you’ll eventually get overwhelmed by a horde of re-animated dead bodies, including your own fallen Battle Brothers. In the upcoming open pre-alpha of the tactical combat you will have the opportunity to fight this guy and find out the best tactics to beat him. We are constantly adding little things like new skills, weapons and equipment to the game. Last week we put a new two handed weapon in the game that comes with a unique and utility-oriented skill set, although it doesn’t do the most damage. This is the Bill, also called English Bill or Bill-Hook. It is a gruesome pike-like weapon with a blade and a hook attached. The Bill grants its wielder two skills, “Impale” and “Hook”, that both have a lot of utility to them. With “Impale” you can attack from two tiles away, outside the range of any other melee weapon currently in the game, so your Battle Brother can stand behind the frontline in relative safety and still get attacks in due to the long range of the Bill. The second skill, “Hook”, is used to pull an enemy that is two tiles away one tile closer. This is great way to break enemy formations (those Shieldwalls! ), drag enemies down from higher elevation or pull them away from your archers should they manage to pin them. We’re sure that players will find a lot of situations to make good use of the added tactical options provided by the Bill. 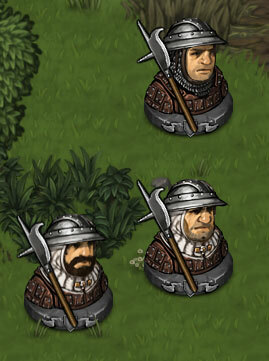 Of course, the same goes for the AI, which will use Bills as well to drag your Battle Brothers out of tight formations! Speaking of AI, this is something we’re constantly tweaking as well as development continues. Already, the AI is quite competent in using the skills available to it and has no qualms about knocking Battle Brothers down ledges to get to a better position, split shields with axes if faced with a Shieldwall or retreat to a defensible position if it gets overwhelmed. Aside from implementing the Necromancer’s AI, this week we’ve tweaked the defensive behavior and taught it to use Spearwalls so it can have any charge stop dead. That is, if the enemy is intelligent enough – Zombies certainly aren’t. We should have a whole article devoted to our AI design eventually. Finally, work also continued on our inventory system. With no funding for the game yet, progress is somewhat slowed by the fact that not everyone of us is able to devote as much time to Battle Brothers as we’d like, but we’re making progress here as well. In a future article we’ll cover the inventory with all the juicy details! We recently shifted our focus on the design and construction of the worldmap and strategic gameplay. Although we had a rough idea of the gameplay we wanted for the strategic part from the beginning, there’s still a lot to do here. What visual style do we want? An old map style? A more realistic representation? How do we implement this technically? Do all the gameplay features we thought of fit together for a coherent whole? Do the tactical and strategic layers feel sufficiently connected? Is it going to be fun this way? We have some pretty exciting stuff up our sleeves but it is too early yet to show it to you as we’re still constantly changing things around. Just this much: The strategical part of the game will not have to hide behind the tactical combat part! Aaaand a quick mention regarding music and sound effects. What effects you might have heard in our gameplay videos are placeholders, sounds we put in the prototype to get a general idea of how things would feel with sound. 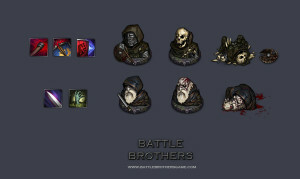 We are now slowly extending our antennas in various directions to get some talented sfx artist and/or composer on the project who will create something uniquely fitting for Battle Brothers. However, we’re still in a pretty early stage regarding this and we want to get the gameplay right before focusing on presentation and sound.